The Progressive Conservatives ended mandatory ancillary student fees to tackle the red menace. “Students were forced into unions and forced to pay for those unions,” Premier Doug Ford said of the fees that helped to bankroll student government. “He seems to think his opt-out plan will help students and defund radical organizations. What he will actually defund are diversity clubs, student newspapers, (LGBT) centres, food banks, walk-home programs, Indigenous centres, and other important programming,” said Hunter. Ford's slogan, "For The People" needs to be re-worked. He actually works "For The (Wealthy) People." I'm not looking forward to our next contract negotiations in the fall. It's not going to be pretty. I fully expect we'll see him make teaching an essential service, and next will be to mandate coaching and club facilitation to eliminate any bargaining tools. The future will be difficult for educators, Marie. I sympathize with you. Things were difficult for us during the Harris years. They could be even more difficult during the Ford years. A drop-out with a 2-month stint at Humber College is hardly going to appreciate education. Of course his education arose mainly from selling questionable products out of the trunk of his dad's car. Oh well, the people of Ontario saw fit to elect that mallet-headed thug and I've seen no sign that anyone within the party ranks will curb his mulish obsessions so the path is clear that might make him more harmful to your province than even Mike Harris. Things could become worse the Harris years, Mound. Ontarians should have known who and what they would get. Unfortunately, too many of us were fools. Ford is a living, breathing illustration of why a good education is vital, Owen. It is the best-known inoculation against the chances of winding up like the ignorant buffoon that the Premier is. Well put, Lorne. Of course, Ford doesn't know what he missed. But every time he opens his mouth, it's evident that he never learned much. Ah, I do see the fine hand of Gordon Campbell here on the attack on education. B.C. went through that also. It isn't really an attack on education. its an attack on the Teachers Union. When you take over a government, you want to eliminate the opposition and those who might organize an opposition. Teachers are always able to organize and speak to the interests of their students. People actually listen. it would appear the thing which frightens Ford also are university students. Weakening their Union, is a very smart move for some one who is going to attack the social structure of the province. They may not make teaching an essential service. They never did in B.C. When teachers go on strike, the government saves a lot of money. They also hope the public will turn on the teachers and you can expect a minority to do so. Many parents will be out raged because there will be no where to send their kids while they work. They don't value education that much, its more the day care facilities they provide. it is interesting Ford is attacking the University students. In B.C. it was mostly an attack on the public K-12 group. One the other hand B.C. universities make a fortune on over seas students. As usual, I'd suggest people check out some of the B.C. progressive blogs to see how things turned out here for education, closing and selling off schools, long commutes for children in rural areas, increased class sizes--teachers fought through the courts and won; elimination of teachers' aides. It was during this time many parents did send their children to private schools because that was the intent, weaken the public system and strengthen the private system. Good luck there in Ontario. 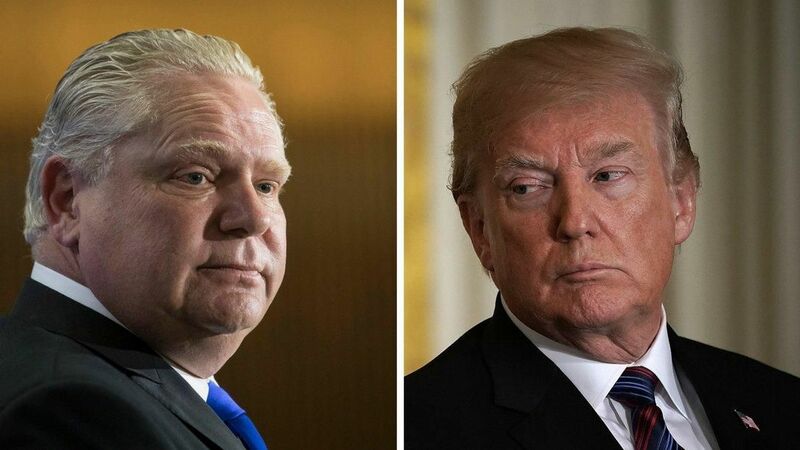 You voted for Ford, now you will have to live with it or die because of it. The last time around, teachers made life difficult for the Harris folks, e.a.f. That's why, when Dalton McGuinty was elected, he declared himself "the education premier." He wanted the teachers on his side. Ford figures he can scapegoat teachers. We'll get a chance to see how that works out. Pence put in right to work legislation in Indiana. Union dues are optional. A lot of that in the States - starve a union for the Big Man. Never heard of any of them abolishing student union fees at universities though. Looks like Doug is at the forefront of pushing dose darn Merxists, Commies and fellow travellers back down the undoubted rathole they crawled out of. All ten of them, pretending to be genuine university students. Meanwhile the young right wing nutballs who hate immigrants and people of colour get their picture taking with the Fraud hisself, man of the people. "Hi there I'm Doug your premier, and I'm profoundly stupid even if I do say so myself." As the Brits would say with pity: "You've got a right one there!" Best of luck, Ontario. It’s another page from the introductory chapter of the Libertarian Handbook for Situational Rugged Individualists. We get it: “forced unionism”; “workplace democracy”; etc. Let’s take it to the kids. Tell them that they’re individuals standing up to the lefty elitists. Don’t let them get used to organizing themselves into anything. It’s easier to hammer them in the marketplace one at a time. Just ask any “first-job” creator. We've got ourselves in a pickle, BM. The next three and a half years will not be pleasant. Sorry for the late response, John. For these folks, education is all about indoctrination. It's not about how to think. It's about what to think.